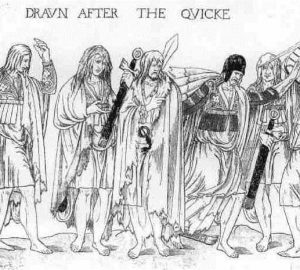 (820-902) Gaelic Ireland; Raiding and Trading with the Vikings. This episode looks at the widespread war and confusion of 9th century Ireland and looks at what life was like in the first settlement at Dublin. The 820-40’s saw the Vikings step it up a gear as vast fleets attacked Ireland and establish bases called longphorts around the coast. However by the late 840’s Gaelic Ireland struck back and the Vikings changed their tactics by forming alliances with Gaelic kingdoms. The map below shows the rough location of the site of the longphort which is marked in red. In the 9th Century this site was flanked by the Liffey to the North and the Poddle which has since been channeled in tunnels beneath the city, (if you walk up Dame street, it dips just before Dublin castle beneath this dip the Poddle flows toward the Liffey). The blue circle roughly marks the site of the pool – An Dubh Linn or Dublin as we know it. This pool has also been filled in, but this map gives some appreciation of the advantages this natural harbor provided the Vikings. This location is not the only suggested location. There are two other theories however these seem less likely the more we understand the 9th century. One such theory has argued the longphort was semi-rural in nature spreading all along the southern bank of the river with a fortification to provide safety in times of attack. Although it appears the Vikings eventually reached a non confrontational relationship with its surrounding Gaelic neighbours it’s unlikely that such a vulnerable settlement would be constructed particularly after the sack of 849. The other dominant theory suggests longphort was situated further up river closer to the graves found at Kilmainham. This makes more sense than the semi rural theory however this is largely disproved by the 9th century discoveries in Templebar talked about in the podcast marked by the red patch on the map. Consider becoming a monthly donor or giving a once off donation. Or simply share this podcast with your friends. You can support Historian Fin Dwyer to produce award winning, high quality content - become a patron and unlock exclusive content painstakingly researched by Fin. A unique 2 hr multimedia experience with Historian Fin Dwyer. This 2 hour Dublin Famine Tour is a unique experience combining a tour leader with an immersive multimedia device bringing to life the the story of the famine - find out more. So whats this blog about then? 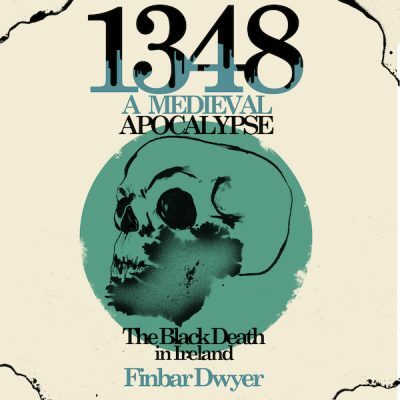 My Name is Fin Dwyer, I am 36 year old historian, author and podcaster. I studied archaeology and Greek and Roman Civilisation in University College Dublin and completed a masters in archaeology in 2004. 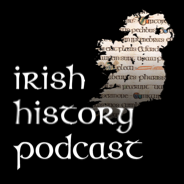 Find out why I started Irish History Podcasts. © 2019	Irish history podcast.